It’s close to noon on a Saturday in early May. 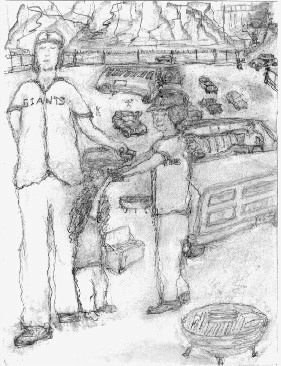 Tom O’Boyle is drawing counterfeit reentry stamps on the hands of a couple of kids from Hunters Point as the Candlestick parking lot begins to fill. “What about next year, Tommy?” the younger of the two inquires of the tall graying Irishman from the Sunset, known by every concessionaire, usher, security guard, and stadium cop as Tommy O. “Don’t worry, lads, we’ll figure something out,” Tommy assures them. The kids smile. With their entrance to the game now a sure thing, they join their friends and head into the yard for batting practice. Tommy O. must be the only ticket broker in the world who has never bought or sold a ticket. Every ducat he accepts over the course of two hours is handed to someone else, mainly neighborhood kids from the projects. I (almost) feel guilty at accepting my own. “Don’t sweat it, Lawls,” Tommy tells me. “Everyone is pretty much set, and we’re going in early today.” We wrap up the leftover food to take inside, tidy the area, being sure to leave the cans and bottles for the collectors, and start toward the gate. The third base foul pole is our home and was even before the young Dusty Baker replaced Pedro Guerrero in left field because Lasorda was afraid our stormy relationship with the Dodgers outfielder would escalate beyond words. Fred the usher greets us and tells Tommy that his girls are waiting for him. Valentina is about four years old, and she worships the big Irishman. “That girl won’t shut up till you get here, Tommy,” gripes Tina’s mom as she braids the hair of her older daughter, hiding a smile from both Tommy and her younger child. The little black girl is Tommy’s favorite, a fact not missed even by young Tina. She screams and laughs and punches at Tommy’s back as he jokingly threatens to drop her. She has practically grown up at the ballpark, as have all the kids in Section 24, thanks to Tommy O. and his unique ability to extract tickets from generous and unsuspecting fans - and further ability to draw a perfect handstamp. The game starts. “Laurie the Legend” barks hard at the Brewers left fielder, unusual only because it’s the second inning and Laurie normally prefers to save her infamous pipes until later in the game. Right away, people in the crowd recognize the heckling queen and begin to cheer her on. “Get ’em, Laurie!” they shout. “Give ’em hell!” A young couple behind us attempt to spot her. “That’s the chick I told you about,” the guy says to his girlfriend as he scans the seats. A long fly ball lands to our right and is quickly grabbed by a man in an Australian hat. “How about givin’ that ball to a kid, man?” offers Tommy. “My first game, mate,” the Aussie retorts, prompting boos from our section and even his own. Tommy calmly holds up a hand to quiet our section, then walks over with a batting practice ball. A deal is made with the Aussie, and everyone claps. Tommy tosses the ball to the kid whom the Aussie had, in our eyes, momentarily robbed of his childhood, and more cheers erupt. Cammy the schoolteacher arrives in the third inning carrying her usual assortment of snacks. In her arms are boxes of ice cream sandwiches that her school generously “donated” for today’s game. She promptly tosses them to any kids or wannabe kids in our section. “Better eat ’em fast, they’re gonna melt!” the teacher shouts, exposing a suspicious similarity to the Robin Hood resolve of Tommy O.
Tommy’s younger brother Brian shows up and we talk about catching baseballs. “How many balls you caught out here, Den?” he asks. “None,” I admit. “Been coming to this place since ’71 and not a thing to show for it.” “Well, you better get crackin’,” Brian advises, “there’s only about sixty games left.” He laughs. Tim Gallagher, whose appearances at the yard are outnumbered only by those of the players and park staff, is incredulous. “You’re joking, right?” he says as he and Leo, another Section 24 regular, stare in astonishment. I attempt to downplay my ineptitude. “Just not in the right place at the right time, I guess.” This time, however, my response does not include the obligatory smile. The seventh inning stretch arrives, and a Section 24 lifer named Dan performs his ritual of tossing handfuls of candy to people in all directions, even to the drunk college kids in the aluminum seats. People are slowly beginning to leave. The Giants have the game in hand, and Saturday traffic awaits. As the eighth inning begins, Brewers third baseman Sean Berry rips a shot toward left field about six feet off the ground. Even Barry Bonds can’t beat it to the wall. The ball bounces in front of the warning track, then hops over Barry and the fence, landing at my feet like the morning paper. I pick up my first baseball after close to thirty years of ballgames at Candlestick. A ground rule double hit by the opposing team. “Throw it back! !” the crowd chants. I stare in amazement at the ball that has eluded me for so long but somehow managed to materialize on this magical afternoon. Tommy O. walks over, laughing. “Lawls, you ain’t throwin’ it back and you ain’t givin’ it to no kid. You better keep that one.” That ball sits on the mantel in my living room, and always will. I have yet to see Tommy O. at the new ballpark, or any of the other kids of all ages that made Section 24 so special. The traditions that were religiously enforced at Candlestick did not survive the move across town, and thus they no longer exist. People on cell phones waving to one another is the most popular tradition the new yard has created. I’ll keep my memories of Tommy O. and little Tina on the shelf next to my only baseball. There they will remain, immortalized and untouchable, as I search for my friends from Section 24 among the packed crowds of nameless faces at Pacific Bell Park.